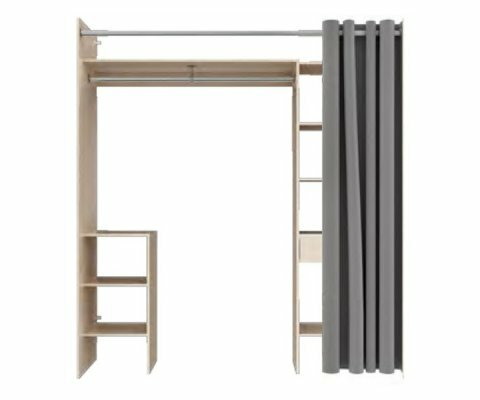 BUILT TO LAST: Made from top-grade particleboard and put together with heavy-duty steel hardware, the wardrobe is sturdy and strong, without sagging or splitting under weight. ADJUSTABLE CLOSET: The width can be adjusted from 51.2” to 70.9”, providing an instant closet that fits in any guest room/office space, or anywhere in your home. LOTS OF STORAGE: There’s a full length hangrail, a section of half-length hangrail with three open shelves beneath, a long upper shelf, and stacked shelves down one whole side with a drawer for small item storage. CURTAIN COVER: A full-length gray curtain has large grommets for easy sliding on a sturdy rod, covering the entire wardrobe front and opening easily to access clothing. 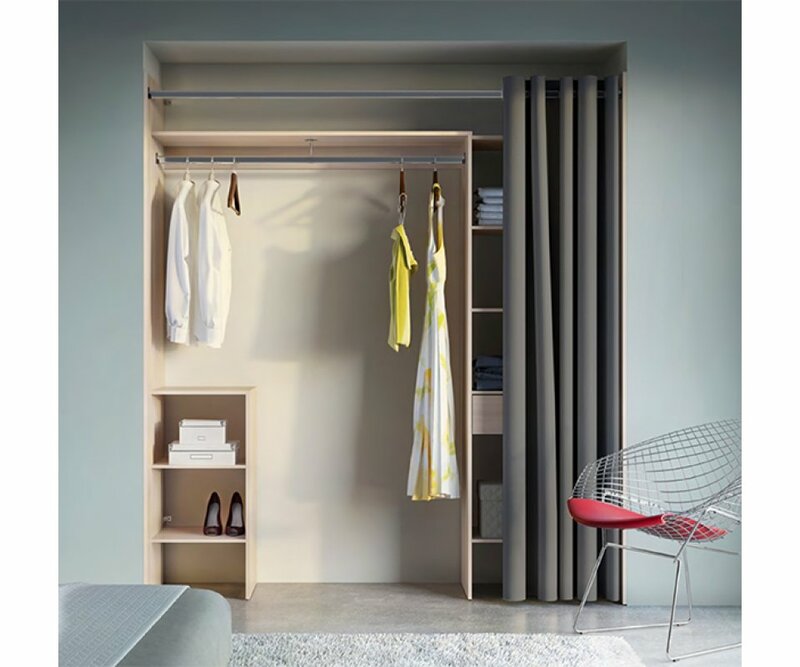 The Dona Wardrobe is designed for studio apartments or a bedroom or office with no closet space. It’s easy to provide guests with room to hang clothing with this configuration that adjusts from 51.2” to 70.9” in width. The wardrobe is made in a light beige-gray woodgrain veneer finish that is neutral and contemporary, and coordinates with most home décor styles and colors. It is built to last, made from top-grade particleboard and joined with heavy-duty steel hardware, with durable veneer finish that resists scratches, chips, stains, and fading from UV rays. There’s a full-length hangrail, a ½ length hangrail, shoe cubbies, and a full set of stacked shelves, as well as a full width upper shelf, and concealed behind a light gray curtain with large grommets that slide easily along the curtain rod. If you need a creative solution to your home storage situation, this is the perfect choice for you!